“Now you have seen this Vrindavana forest, full of flowers and resplendent with the light of the full moon... You have seen the beauty of the trees, with their leaves trembling in the gentle breeze coming from the Yamuna... So now go back to the cowherd village. Don’t delay. O chaste ladies, serve your husbands and give milk to your crying babies and calves.. On the other hand, perhaps you have come here out of your great love for Me, which has taken control of your hearts. This is of course quite commendable on your part, since all living entities possess natural affection for Me..."
"O asvattha tree, O plaksa, O nyagrodha, have you seen Krishna..? That son of Nanda Maharaja has gone away after stealing our minds with His loving smiles and glances..."
"O kurabaka tree, O asoka, O naga, punnaga and campaka, has Balarama’s younger brother, whose smile removes the audacity of all proud women, passed this way...?" "O most kind tulasi, to whom the feet of Govinda are so dear, have you seen that infallible one walk by, wearing you and encircled by swarms of bees...?" "O cuta, O priyala, O panasa, asana and kovidara, O jambu, O arka, O bilva, bakula and amra, O kadamba and nipa and all you other plants and trees living by the banks of the Yamuna who have dedicated your very existence to the welfare of others, we gopis have lost our minds, so please tell us where Krishna has gone..."
"O trees, Tell us where are our's beloved Krishna....O trees, we see that you are bowing down... 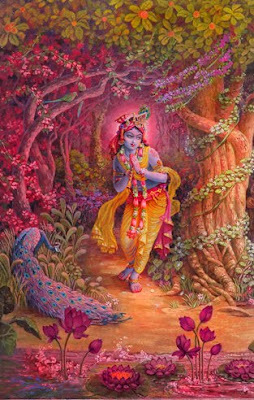 When the younger brother of Rama walked by here, followed by intoxicated bees swarming around the tulasi manjaris decorating His garland, did He acknowledge your obeisances with His affectionate glances? He must have been resting His arm on the shoulder of His beloved and carrying a lotus flower in His free hand..."
After that all the gopies talked among themselves : "Let us ask these creepers about Krishna... 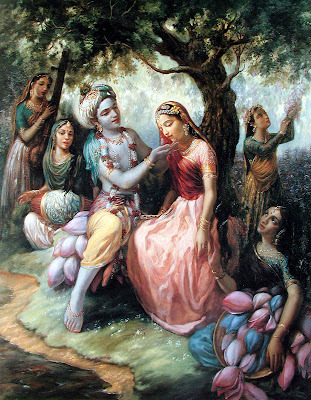 Even though they are embracing the arms of their husband, this tree, they certainly must have been touched by Krishna’s fingernails, since out of joy they are manifesting eruptions on their skin." Having spoken these words, the gopis, distraught from searching for Krishna, began to act out His various pastimes, fully absorbed in thoughts of Him. One gopi climbed on another’s shoulders and, putting her foot on the other’s head, said, "Go away from here, O wicked snake! You should know that I have taken birth in this world just to punish the envious..."
Then another gopi spoke up: "My dear cowherd boys, look al this raging forest fire! Quickly close your eyes and I will easily protect you..."
When one gopi perfectly imitated how Krishna would call the cows who had wandered far away,... how He would play His flute and how He would engage in various sports, the others congratulated her with exclamations of "Well done! Well done!.." "O beloved Krishna, Your birth in the land of Vraja has made it exceedingly glorious, and thus Indira, the goddess of fortune, always resides here... It is only for Your sake that we, Your devoted servants, maintain our lives. We have been searching everywhere for You, so please show Yourself to us..."
"O Lord of love Mohana, in beauty Your glance excels the whorl of the finest, most perfectly formed lotus within the autumn pond... O bestower of benedictions, You are killing the maidservants who have given themselves to You freely, without any price. Isn’t this murder...?" "O greatest of personalities Krishna, You have repeatedly saved us from all kinds of danger—from poisoned water, from the terrible man-eater Agha, from the great rains, from the wind demon, from the fiery thunderbolt of Indra, from the bull demon and from the son of Maya Danava..."
"O Beloved Shyamsundar! You are not actually the son of the gopi Yasoda, O friend, but rather the indwelling witness in the hearts of all embodied souls... Because Lord Brahma prayed for You to come and protect the universe, You have now appeared in the Satvata dynasty..."
"O best of the Vrsnis Shri Krishna! Your lotuslike hand, which holds the hand of the goddess of fortune, grants fearlessness to those who approach Your feet out of fear of material existence... O lover, please place that wish-fulfilling lotus hand on our heads..."
"O beloved Krishna! You who destroy the suffering of Vraja’s people, O hero of all women, Your smile shatters the false pride of Your devotees... Please, dear friend, accept us as Your maidservants and show us Your beautiful lotus face..."
"O Saawariya! Your lotus feet destroy the past sins of all embodied souls who surrender to them... Those feet follow after the cows in the pastures and are the eternal abode of the goddess of fortune... Since You once put those feet on the hoods of the great serpent Kaliya, please place them upon our breasts and tear away the lust in our hearts..."
"O lotus-eyed one, Your sweet voice and charming words, which attract the minds of the intelligent, are bewildering us more and more... Our dear hero, please revive Your maidservants with the nectar of Your lips..."
"O Krishna! The nectar of Your words and the descriptions of Your activities are the life and soul of those suffering in this material world... These narrations, transmitted by learned sages, eradicate one’s sinful reactions and bestow good fortune upon whoever hears them. These narrations are broadcast all over the world and are filled with spiritual power... Certainly those who spread the message of Godhead are most munificent..."
"O Kanha! Your smiles, Your sweet, loving glances, the intimate pastimes and confidential talks we enjoyed with You—all these are auspicious to meditate upon, and they touch our hearts. But at the same time, O deceiver, they very much agitate our minds." "Dear Krishna, dear lover, when You leave the cowherd village to herd the cows, our minds are disturbed with the thought that Your feet, more beautiful than a lotus, will be pricked by the spiked husks of grain and the rough grass and plants..."
"O Shyamsundar! At the end of the day You repeatedly show us Your lotus face, covered with dark blue locks of hair and thickly powdered with dust.. Thus, O hero, You arouse lusty desires in our minds..."
'O Kesava! Your lotus feet, which are worshiped by Lord Brahma, fulfill the desires of all who bow down to them... They are the ornament of the earth, they give the highest satisfaction, and in times of danger they are the appropriate object of meditation... O lover, O destroyer of anxiety, please put those lotus feet upon our breasts..."
"O Manmohan! , kindly distribute to us the nectar of Your lips, which enhances conjugal pleasure and vanquishes grief... That nectar is thoroughly relished by Your vibrating flute and makes people forget any other attachment..."
"O Govind ! When You go off to the forest during the day, a tiny fraction of a second becomes like a millennium for us because we cannot see You... And even when we can eagerly look upon Your beautiful face, so lovely with its adornment of curly locks, our pleasure is hindered by our eyelids, which were fashioned by the foolish creator..."
"Dear Acyuta ! You know very well why we have come here... Who but a cheater like You would abandon young women who come to see Him in the middle of the night, enchanted by the loud song of His flute..? Just to see You, we have completely rejected our husbands, children, ancestors, brothers and other relatives..."
"O Kanhaiyaa! Our minds are repeatedly bewildered as we think of the intimate conversations we had with You in secret, feel the rise of lust in our hearts and remember Your smiling face.., Your loving glances and Your broad chest, the resting place of the goddess of fortune. Thus we experience the most severe hankering for You..."
"O beloved Krishna! Your all-auspicious appearance vanquishes the distress of those living in Vraja’s forests... Our minds long for Your association. Please give to us just a bit of that medicine, which counteracts the disease in Your devotees’ hearts..."
"O dearly beloved Shyamsundar! Your lotus feet are so soft that we place them gently on our breasts, fearing that Your feet will be hurt... Our life rests only in You. Our minds, therefore, are filled with anxiety that Your tender feet might be wounded by pebbles as You roam about on the forest path..."
"Some people reciprocate the affection only of those who are affectionate toward them, while others show affection even to those who are indifferent or inimical... And yet others will not show affection toward anyone. Dear Krishna, please properly explain this matter to us..."
"So-called friends who show affection for each other only to benefit themselves are actually selfish... They have no true friendship, nor are they following the true principles of religion... Indeed, if they did not expect benefit for themselves, they would not reciprocate..."
"O My dear slender-waisted gopis, some people are genuinely merciful or, like parents, naturally affectionate... Such persons, who devotedly serve even those who fail to reciprocate with them, are following the true, faultless path of religion, and they are true well-wishers... "
"Then there are those individuals who are spiritually self-satisfied, materially fulfilled or by nature ungrateful or simply envious of superiors... Such persons will not love even those who love them, what to speak of those who are inimical... But the reason I do not immediately reciprocate the affection of living beings even when they worship Me, O gopis, is that I want to intensify their loving devotion... They then become like a poor man who has gained some wealth and then lost it, and who thus becomes so anxious about it that he can think of nothing else..."
"O dear gopies, understanding that simply for My sake you had rejected the authority of worldly opinion, of the Vedas and of your relatives, I acted as I did only to increase your attachment to Me... Even when I removed Myself from your sight by suddenly disappearing, I never stopped loving you... 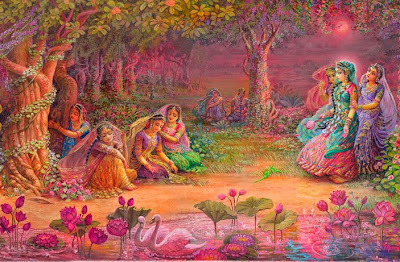 Therefore, My beloved gopis, please do not harbor any bad feelings toward Me, your beloved..."
"I am not able to repay My debt for your spotless service, even within a lifetime of Brahma... Your connection with Me is beyond reproach. You have worshiped Me, cutting off all domestic ties, which are difficult to break... Therefore please let your own glorious deeds be your compensation..."
"Lord Shri Krishna’s dealings with the gopies occurred under special circumstances... 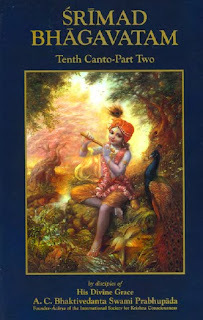 Most of the gopies in their previous lives were great sages, expert in the study of the Vedas, and when Lord Shri Krishna appeared as Lord Shri Ramacandra they wanted to enjoy his company... Lord Shri Ramacandra gave them the benediction that their desires would be fulfilled when He would appear as Shri Krishna... Therefore the desire of the gopies to enjoy the appearance of Lord Shri Krishna was long cherished... So they approached goddess Katyayani to have Shri Krishna as their husband... There are many other circumstances which also testify to the supreme authority of Shri Krishna and show that He is not bound by the rules and regulations of the material world... In special cases, He acts as He likes to favor His devotees. This is only possible for Him, because He is the supreme controller..."
"Since Lord Shri Krishna is the Supreme Lord dwelling within the gopies, their so-called husbands and all other living beings, what possible sin could there be on His part if He embraces some of the beings He Himself has created...? What fault could there be if the Lord goes with the gopies to a secret place, since He already dwells within the most secret part of every living being, the core of the heart...?" "Shri Krishna, the Supreme Personality of Godhead, was already present as the Supersoul within the bodies of the gopies and their husbands... He is the guide of all living entities, as is confirmed in the Katha Upanisad: The Supersoul directs the individual soul to act, and the Supersoul is the actor and witness of all action..."
"Another important point is that none of the gopies who danced with Krishna were in their material bodies...They danced with Shri Krishna in their spiritual bodies. All their husbands thought that their wives were sleeping by their sides... 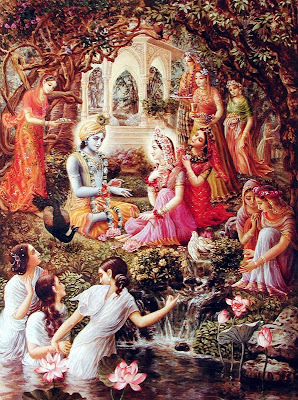 The so-called husbands of the gopies were already enamored with the influence of the external energy of Shri Krishna; so by dint of this very energy they could not understand that their wives had gone to dance with Shri Krishna... What then is the basis of accusing Shri Krishna of dancing with others’ wives? The bodies of the gopies, which were their husbands’, were lying in bed, but the spiritual parts and parcels of Shri Krishna were dancing with Him... Shri Krishna is the supreme person, the whole spirit, and He danced with the spiritual bodies of the gopies. There is therefore no reason to accuse Krishna in any way..."
"श्रीमद भागवतम सम्पूर्ण वेदों और शास्त्रों का सार तत्त्व होने के साथ साथ प्रभु श्री श्यामसुन्दर का साक्षात वांग्मय विग्रह हैं.....श्रीमद भागवतम साक्षात शब्द ब्रह्म हैं.... श्रीमद भागवतम के १२ स्कंध साक्षात् प्रभु श्री श्यामसुन्दर के एक एक अंग है....और दसवा स्कंध प्रभु श्री श्यामसुंदर का साक्षात् हृदय स्वरुप हैं..... इसी श्रीमद भागवतम के दसवे स्कंध में गोपियों का विरह गीत हैं...."
"रास के बीच में प्रभु श्री श्यामसुंदर के अतार्ध्यान हो जाने पर, गोपियों को उस समय प्रभु से मिलाने वाला कोई न दिखा... जबकि गोपियों ने वृक्षों, तुलसी जी, यमुनी जी आदि से प्रार्थना भी की, परन्तु कोई भी उन व्याकुल गोपियों को प्रभु श्री श्यामसुन्दर का दर्शन नहीं करा सका.... अंत में गोपी गीत के द्वारा ही गोपियों को प्रभु का दर्शन हुआ....उस समय गोपियों के द्वारा विरह भाव में गाया गया गीत ही गोपी गीत हैं....जो कोई भी प्रेम भाव से इस परम पवित्र गोपी गीत को सुनता है या गाता है, उसे प्रभु श्री श्यामसुन्दर की अनन्य भक्ति और प्रेम की प्राप्ति होती हैं...."
Written about 3 Month ago. Shashikant Gupta, Rohan Shanti Shukla, Ramesh रमेश Oluk and 12 others like this. 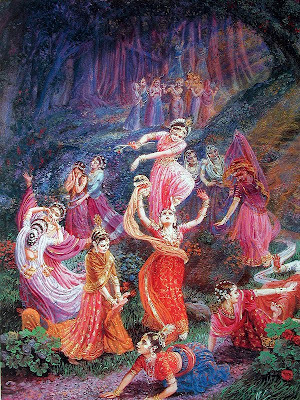 The Srimad Bhagavatam's Gopi-geet describes an instance in which the gopis themselves performed kirtana with a view to be reunited with the high note of their life. "I bow to the Lotus Feet of those Gopies,who has the ethernal, uncondtional Love for Supreme Lord Sri Krishna.."
"Hum Prem Diwani Hai,Woh Prem Diwana"
Wonderful, thank you so much Mukesh ji! srila visvanatha cakravarti thakura has commenetd very nicely only this gopi-gita chapter in his commentary named SARARTHA DARSINI ,"this chapetr shines forth with the GOPI-GITA,the songs of the gopis,which are like a group of lotus flowers fragrant with the honey of PREMA,that manifest their sweetness in graceful melodies and rhythms.these lotus songs attract the bee named Krsna. Thank you very much! Hari bol!!! Thanks & Congratulations for being instrumental in sharing such a divine message ! jai shree krushna.....GOPI GEET ke liye bahut bahut aabhaar....radhe radhe. Really wonderful! I owe u. Since Lord Krishna is the Supreme Lord dwelling within the gopies, their so-called husbands and all other living beings, what possible sin could there be on His part if He embraces some of the beings He Himself has created? What fault could there be if the Lord goes with the gopies to a secret place, since He already dwells within the most secret part of every living being, the core of the heart? !! 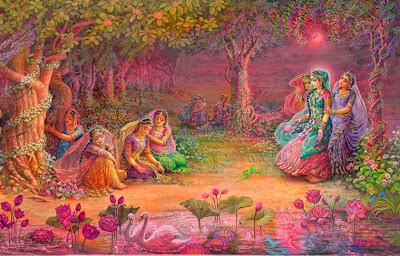 Jay Jay Shri Radha Shyamsundara ! !